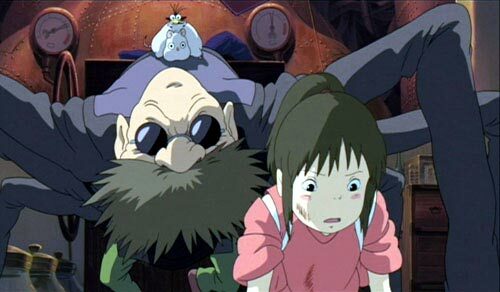 There is nothing quite like a Miyazaki movie to make a sick day feel better. So, while I languished in a gallbladder-pain-induced stupor today, I decided it was high time to continue my chronological viewing of Studio Ghibli’s films with Spirited Away. And, hey, it happened to be a Monday today, so happy Miyazaki Monday once again! Now, this is a significant film for me. I first heard of it while watching for The Two Towers to snag a few (unfortunately, a very few) Oscars in 2003. And after seeing it win Best Animated Feature, my brother and I watched the film together — it was the very first Studio Ghibli film I’d ever seen. That first viewing was a very long time ago, and watching Spirited Away again was even more spectacular in the light of my enthusiasm for all things Ghibli (well, except Pom Poko) that’s grown over the years. First of all, Joe Hisaishi’s score is absolutely impeccable. I cannot overstate how wonderful the music sounds, nor how beautifully it bolsters the animation — particularly the title melody, and the delightful piano work in the first boiler room sequence. As far as Ghibli goes, the Spirited Away score is matched only by Hisaishi’s masterful work in Howl‘s Moving Castle, but I’ll get to that some other time. The American voice acting is once again adequate and pleasant — highlighted by Suzanne Pleshette as the elderly and quixotic witch twins and, most impressively, David Ogden Stiers as one of my very favorite characters, Kamajii, the boiler man (pictured above). Can you tell I love the boiler room scenes? Because also, the little soot creatures eating their pastel star foods just make me ridiculously happy! Spirited Away is at once one of the most bizarre and delightful of Miyazaki’s films, which is probably why it is likely the best-known and most-loved among American audiences, despite its thoroughly Japanese flavor. It transports us to a strange and even more foreign Wonderland, where odd faceless creatures drop gold from their transparently smoky appendages, where a radish spirit is a dedicated customer at the bath house, where gigantic babies can be turned into adorably chubby rats, and where, in true Miyazaki style, the kindest people still live in country cottages with magical spinning wheels and friendly lampposts that hop ahead of visitors, lighting the way home. It is gorgeous and enthralling, and while not my personal favorite of Ghibli’s films, it deserves the place it holds as the favorite of many.